White shade cloth reflects the sun's powerful radiation. The interior of a structure will remain cooler than black shade cloth in hot weather, as white shade cloth reflects the heat. Overall any color shade cloth will reduce heat caused by direct sunlight and. The attractive colors of shade cloths are not only attractive with your greenhouse or you backyard, but also help control inside heat build up and be used for decorative use in yard fencing. They are perfect with swimming pools, pergolas, balconies and sports fields. This is the shade cloth of choice for nurseries, retail garden centers, patio lovers, ball diamond fences and tennis courts. Green 60% Shade Cloth: 60% density shade cloth will block out 60% of light. 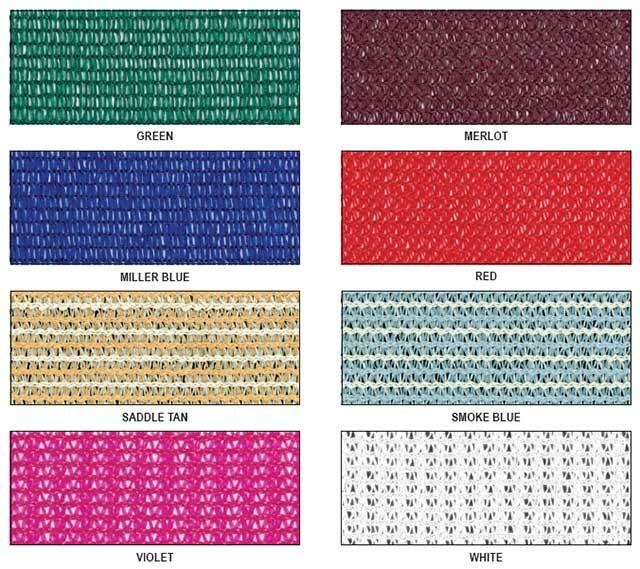 This shade cloth of choice for nurseries, retail garden centers, patio lovers, ball diamond fences and tennis courts. also can be used for your greenhouse or decorative use in yard fencing. White Knitted Shade : Cloth 22% density shade cloth will block out 22% of light. 40% density shade cloth will block out 40% of light. 50% density shade cloth will block out 50% of light. This shade cloth use for flowering plants which will be effected by longer natural light exposure due to an increase in light quantity and duration. White shade cloth absorbs and reflects the white scattered light from the atmosphere. The interior of the structure is cooler than that covered by black shade cloth in hot weather conditions, as white shade cloth reflects the heat. Smoke Blue Shade Cloth: 70% density shade cloth will block out 70% of light. This attractive combination of white and light blue fibers is nice with decorative use in yard fencing. Can also be used for retail areas, swimming pools, pergolas and balconies. Red Knitted Shade Cloth: 80% density shade cloth will block out 80% of light. This red colored shade cloth reduces the solar spectrum of blue, green and yellow light, increasing the red and far-red solar spectrum. Blue Knitted Shade Cloth: 60% density shade cloth will block out 60% of light, This attractive blue shade cloth is a perfect with be used for retail areas, swimming pools, pergolas and balconies and decorative use in yard fencing. Decorative Brown Shade Cloth: 70% density shade cloth will block out 70% of light. This attractive tan colored shade cloth is a perfect with be used for retail areas, swimming pools, pergolas and balconies and decorative use in yard fencing. Violet Knitted Shade Cloth: 45% density shade cloth will block out 45% of light, This attractive colored shade cloth is perfect overheated patios, decks and decorative use in yard fencing.